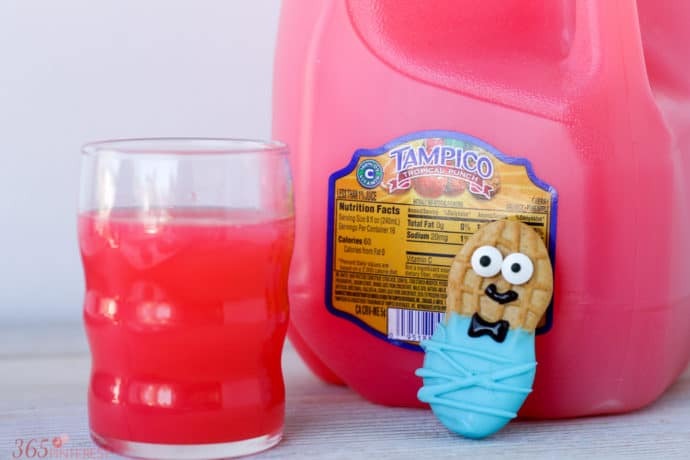 These adorable (and tasty) Little Peanut Cookie Babies are sponsored by Tampico. All opinions are mine. Now that our boys are old enough to enjoy watching full-length movies (rather than 28 minute cartoon episodes OVER and OVER) we like to have movie night on Fridays. Last week we were watching the previews before our movie, and we saw the promo for The Boss Baby. My kids were cracking up at the jokes, especially when the baby started talking! The movie has moved up to the top of our movie night list! One thing I like to do for movie nights is make a special snack to enjoy while we watch, like Easy Popcorn Balls or Brownie Bowls. 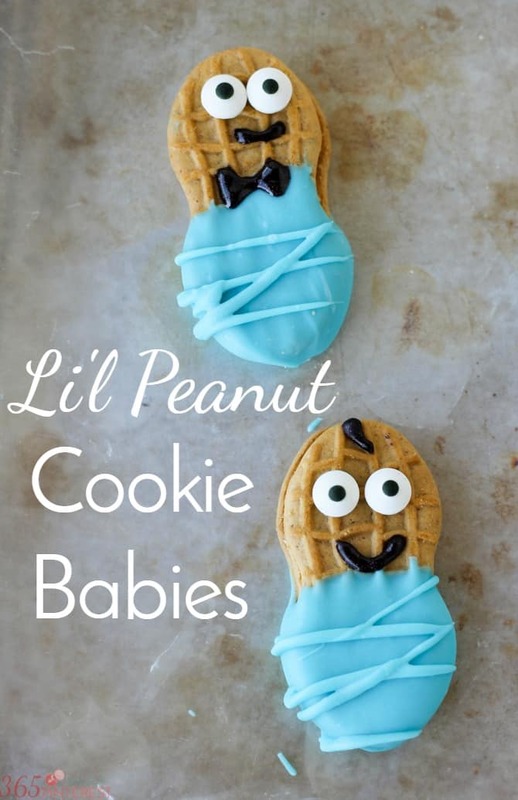 I started thinking about what I could make with the boys when we watch DreamWorks The Boss Baby and I decided to make these cute little cookie babies! The best thing about these Cookie Babies is that they are a no bake treat! You just need a few supplies and these cuties will be ready in minutes! 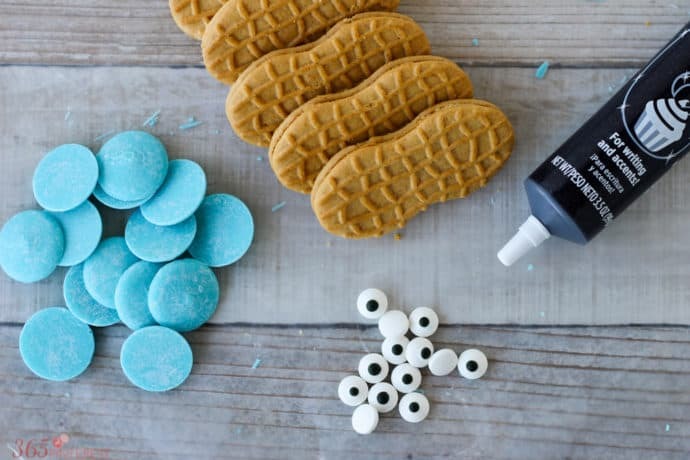 Seriously, whoever invented candy eyes needs a raise, because they make crafting with food so much fun! Allow to set before eating. Yum! I added the cute little bow ties because Boss Baby wears a suit and it seemed appropriate. 🙂 You can buy candy bow ties, but the only ones I could find at our local hobby store were too large. It was easy to make my own with the gel, anyway. 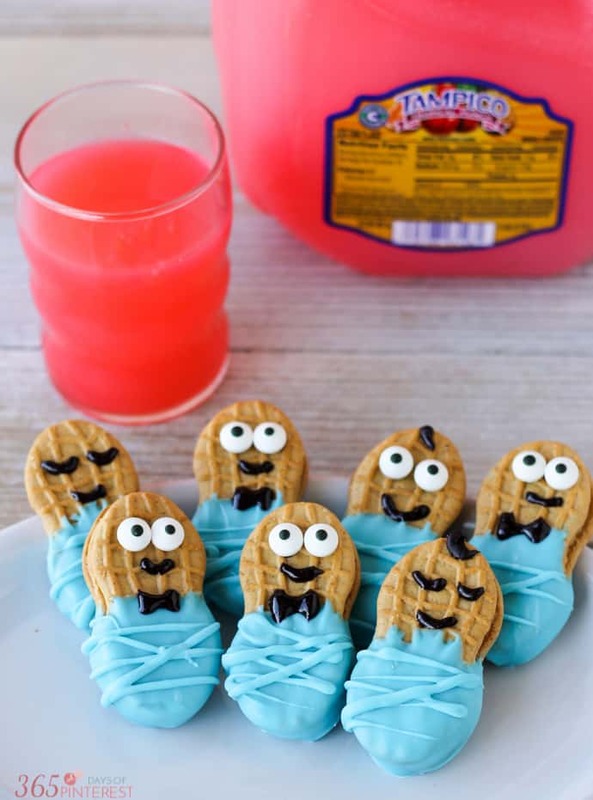 The only other thing we needed was a yummy drink to go with our cookie babies! I picked up a gallon of Tampico Tropical Punch for a sweet treat for the boys. 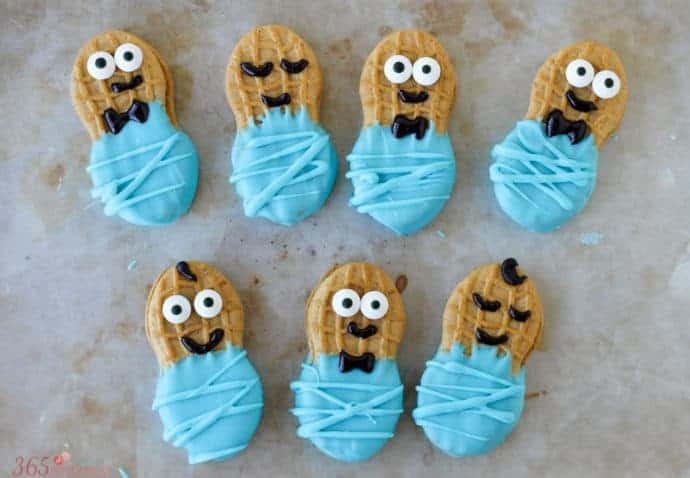 I’m making these adorable cookies for a baby shower. I’m using white chocolate tinted blue and another tinted pink (twins)!! My first trial I just iced the lower part of the front of each cookie. I noticed yours have some kind of line design. How did you do that? I used black gel for the eyes, mouth, and hair. The gel is not getting hard. I plan to put them in small bags to use as favors. Any advice on how to get the gel to set? Thanks! I love the idea!! The gel does not harden unless it’s baked. If they need to be wrapped or stacked, you should use Royal Icing instead. You know the kind of icing they use on those fancy sugar cookies? You can color it black and pipe it on instead. Where can I purchase Royal Icing? You should be able to find a Wilton icing writer at Target. Royal Icing is something you’d have to make, so if you can find the Wilton writers, that would be easiest! You can also get Wilton royal icing mix, which just needs water. 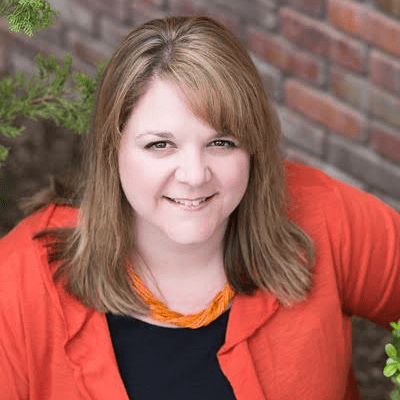 If you can’t find it at Target, you will definitely be able to at a hobby store like Joanne’s or Hobby Lobby in the cake decorating section. Making these for the baby shower I’m planning for my brother and his girlfriend. They are having a girl so I’ll have to change it a tad bit and using pink icing and maybe a bow on top of the head instead of a bowtie. Thanks for the recipe. That sounds so cute! Just a little red gel coloring in some white candy melts or chocolate would be perfect for pink! Darn I couldve used this for the baby shower I hosted this past weekend! I’ll have to save this so that I can refer back to it next time! Oh my goodness, you’re killing me. These are so cute and such a creative little treat! I can’t wait to see Boss Baby with my kids! It really looks like a cute movie! Ummm these need to be served at my next baby shower for sure! How adorable!!! This is an excellent babyshower idea. Super cute & yummy too. OMG these are the cutest! It would be so fun to give them all kinds of expressions. And I love peanut cookies, yum! These would be so cute for a baby shower. I have one soon, and I may have to make these.